Boulder opal, tsavorite, peridot, 18 and 22 karat gold, oxidized silver. 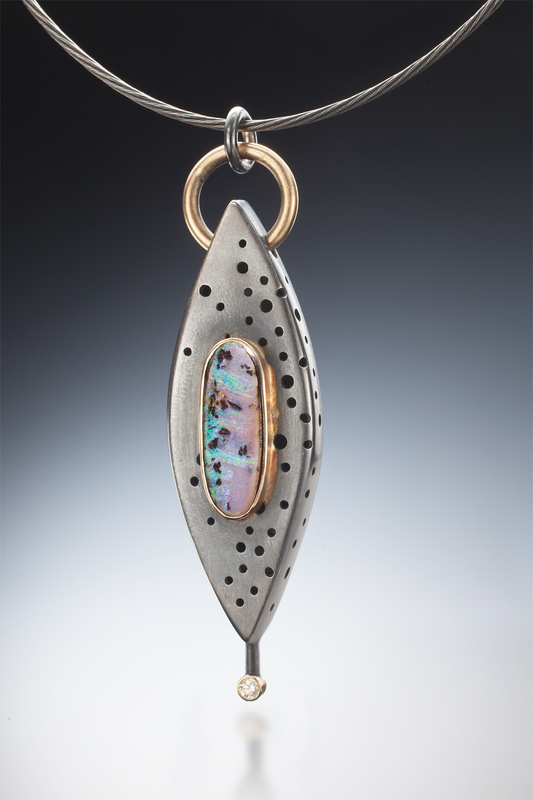 Opals, 22 karat gold, oxidized silver. Moonstone, aquamarine, 22k gold, 18k gold, oxidized sterling silver. Necklace is 16 1/2" long including pendant. Pendant is 1" long x 1 1/2" wide. Moonstone, diamonds, 22K gold, 18K gold, oxidized sterling silver. Pendant is 2 1/2" long x 1 3/8" wide on a 16" oxidized silver cable. Smithsonite, diamond, 22k gold, 18k gold, oxidized sterling silver. Pendant is 1 3/4" long x 1" wide on a 16" silver cable. Boulder opal, diamond, 18k gold, oxidized sterling silver. Pendant is 2 3/4" long x 1/2" wide on a 16" silver cable. Natural black druzy, 22k gold, oxidized sterling silver. Pendant is 1 1/4" long x 5/8" wide on a 18" silver chain. 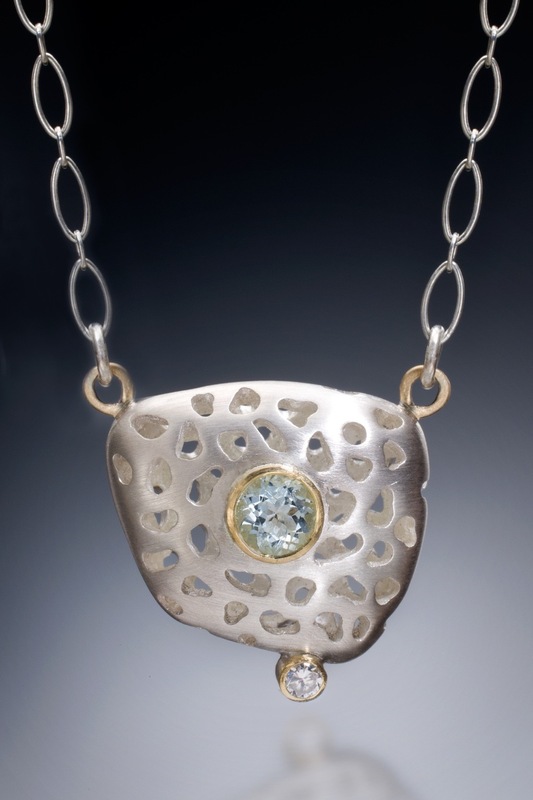 Oxidized sterling silver, 18k gold, diamonds. Pendant is 1 3/4" long x 1/2" wide on a 16" silver chain. Oxidized sterling silver, 18k gold, pink sapphires. Pendant is 1 1/8" long x 1 1/4" wide on a 18" silver chain. Pendant is 1" long x 1 1/4" wide on a 16" silver chain. 17 1/2 inches long x 1" wide. 18" long x 1" wide. 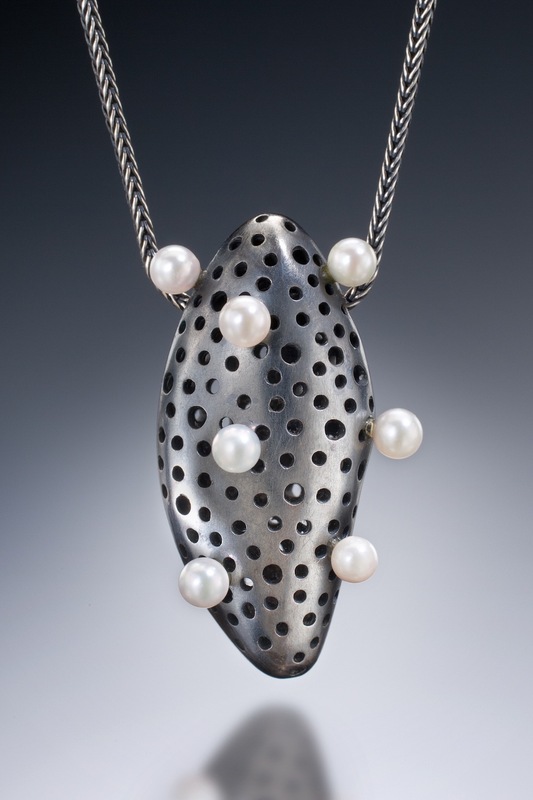 Oxidized sterling silver, cultured pearls. Pendant is 1 1/4" long x 5/8" wide on a 16 1/2" silver chain. Oxidized sterling silver, peridot, carnelian. Pendant is 3/4". Necklace is 17" long. Pendant is 3/4" long x 1/2" wide. Necklace is 18" long. 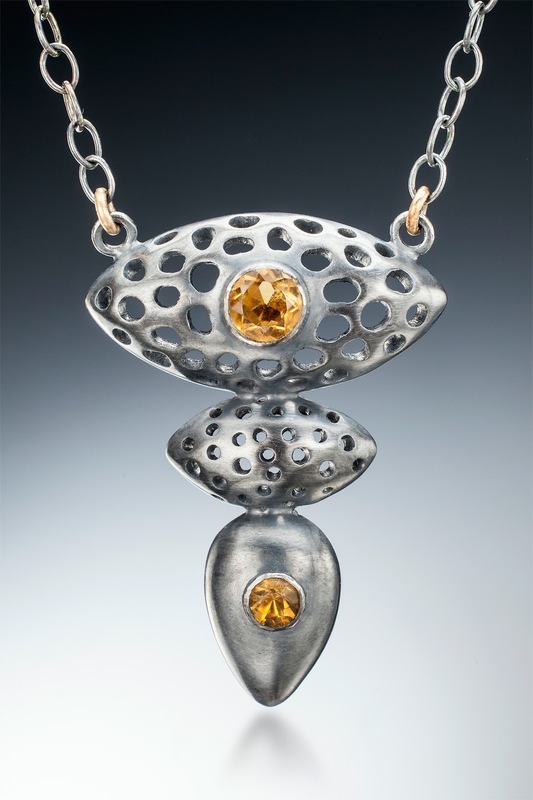 Oxidized sterling silver, 18k gold, citrine. Pendant is 1 3/8" long x 1" wide. Necklace is 17 1/2" long. Sterling silver, 18k gold, aquamarine, diamond. Pendant is 3/4" x 3/4". Necklace is 17" long. Sterling silver, 18k gold, peridot. Pendant is 3/4" diameter on a 17" silver chain.